This page covers intellectual property theft, trade secret theft and copyright piracy in the news. Intellectual property and trade secret theft increases every year. Yet what are companies doing to protect their IP and do they know where it is going? Many companies think they have satisfactory measures in place for protecting their intellectual property through data access. These may be in the form of passwords, biometrics, file encryption, non-disclosure agreements, firewalls, anti-virus, intrusion prevention and employee training. The reality is however is that most companies have no idea where their intellectual property is really going. The agreement however was for hacking of government data and not on corporate cybertheft which many consider to be the primary problem in the space. A Canadian man was sentenced to 18 months in US federal prison after pleading guilty to stealing more than $100 million worth of intellectual property from Microsoft and other companies. The software company Versata said that Ford had produced a program based on its own proprietary software (and used some of its code) to reduce warranty costs and bring vehicles to market faster. November 24th 2014 saw one of the most high-profile intellectual property thefts to this day – Sony Pictures Entertainment was hacked, leading to countless internal emails, profit-and-loss statements, scripts and other documents falling in the wrong hands. Individuals in foreign countries who gain access to the blueprints or designs of such goods can use it to their advantage, reproducing goods and selling them as originals. The Federal Bureau of Investigation reproduces a story involving the intellectual property theft of documents and schematics from GE Oil & Gas, and encourages everyone to take the appropriate measures to protect themselves against it. In May 2013, The Commission on the Theft of American Intellectual Property released a report estimating that the annual losses as a result of international intellectual property theft reach $300 billion/year in the United States. Verizon warns customers about intellectual property theft and publishes an article and report on the risks involved. They conclude that 21% of the successful breaches had inside help and 80% of them exploited normal users, not system administrators. The report said IP theft cost America jobs and suppressed innovation and that foreign IP was also less protected by “weaknesses and biases” in China’s legal and patent systems. When it comes to intellectual property theft, cyber criminals have realised that a company’s legal documents can fetch far more money than a list of credit card numbers, which go for something like $6 a piece on the internet. McAfee reported that as intellectual property theft increases, organizations are less willing to publicize or thoroughly investigate the incident due to cost. They noted that cyber-criminals have shifted their focus from physical assets to data-driven properties, such as trade secrets or product-planning documents, and corporate espionage is now definitely on the increase. Ebook piracy is on the up with whole collections of ebooks (some as large as 2,500 and worth $10,000 or more) being downloaded for free from torrent sites and Pirate Bay. Many people admit they pirate digital content because it is instantly downloadable (and of course free!). According to a study by the Office of Cyber Security and Information Assurance, in 2010, £9.2bn was lost though intellectual property (IP) theft, £7.6bn from industrial espionage and £2.2bn from extortion, with large companies being targeted. In total, UK businesses lost £21bn, while the cost to individual Britons hit £3.1bn and Government £3.1bn. Companies operating in the pharmaceutical, biotech, IT and chemical sectors were the worst hit. Although data snooping is rife in organizations, with over half of IT personnel looking at confidential information they should not be privy to, it is customer lists and R&D plans that ex-employees take with them to competitors. According to the 2009 joint study on Canadian IT security practices everything from viruses to intellectual property theft to abuse by employees cost the average Canadian organization $834,149 in 2009, almost double the amount reported in last year’s study. The average number of reported IT security breaches also soared to 11.3 per organization in 2009, compared to three per organization in 2008. Purdue University’s Center for Education and Research in Information Assurance and Security surveyed 800 companies on intellectual property theft. These 800 companies estimated that they lost a combined $4.6 billion worth of intellectual property last year alone, and spent approximately $600 million repairing damage from data breaches. “Companies are grossly underestimating the loss, and value, of their intellectual property”, said Eugene Spafford, professor of computer science at Purdue University and executive director of CERIAS. “Just like gold, diamonds or crude oil, intellectual property is a form of currency that is traded internationally, and can have serious economic impact if it is stolen.” Intellectual property can account for as much as 85 percent of a company’s value. Organizations representing copyright holders voted for the Intellectual Property Office (a UK Government body) to increase the the maximum fine for all intellectual-property infringement. Iain Connor, a partner at Pinsent Masons, said that prosecutors would take action only in serious cases, and that it was “necessary to have available to judges a penalty which is liable to serve as a deterrent” to commercial copyright infringers. In a 2008 survey, PwC found that nearly half of 5,400 companies in 40 countries reported an increase in industrial espionage. Theft of intellectual property being leaked to the competition was the primary concern with banking, manufacturing and telecoms industries being the hardest hit. Coupons Inc., an electronic coupon technology provider, settled out of court to John Stottlemire who told users on his blog, tenbucks.net, what files to remove in order to print unlimited coupons. Stottlemire took the position that Coupons Inc. had hidden its restrictive files on users’ computers, and that he was just offering instruction on how to delete those files. “Through the use of hiding files and registry keys on a computer, in areas normally reserved for the Windows operating system, Coupons, Inc. attempts to control access to coupons it offers to the public”. He added that no special software was needed to purge those keys. “The only tool required is the delete button on your keyboard and knowledge of where these unprotected files lie.” Stottlemire said that the lawsuit against him will be withdrawn with prejudice as long as he complies with the agreement. Employees and former staff were together responsible for 41 per cent of incidents. “Information has become the new currency of business. Its availability, integrity and confidentiality are crucial components of a collaborative business.” said William Beer, director in the information security group of PwC. The Adobe Flash video server software doesn’t encrypt online content, but only orders sent to a video player such as start and stop play. Adobe dropped a stringent security feature To boost download speeds. Video content can therefore be recorded at will from Amazon’s streaming video service. Bruce Schneier said “It’s a fundamental flaw in the Adobe design. This was designed stupidly”. The FBI alleged that Biswahoman Pani of Worcester copied a host of confidential Intel documents, including 13 “top secret” company files containing highly sensitive design plans for future processor chips. In the complaint, filed in late August 2008 the FBI said that more than 100 pages of sensitive Intel documents, as well as 19 computer-aided-design drawings, were found in a search of Pani’s house conducted on July 1. The Noblemen Group surveyed SEMI’s (SEMI is the global industry association serving the manufacturing supply chains for the microelectronic, display and photovoltaic industries) global members, querying most of the major OEMs and materials companies 49 participated. Results indicate that IP is everyone’s major concern – from general overall systems infringements down to trade secrets and trademarks – with about 53% also expressing concerns regarding IP infringement by customers. SEMI’s white paper concludes that IP theft is costing semiconductor OEMs between $2 to $4B however, those closer to the problem, such as OEMs, think this extremely conservative. One-third of US enterprises recently surveyed admitted losing sensitive data in the past 12 months, while another 11 per cent were ‘unsure’ whether a breach had occurred. Research conducted by the Enterprise Strategy Group for information monitoring firm Reconnex noted that intellectual property protection goes beyond securing private records. Fear of intellectual property theft has become such a priority that 90 per cent of companies plan to deploy new technologies to secure their information in the next 12 months. Vnunet 2007. A key committee in the European Parliament has endorsed a draft directive aimed at harmonizing rules on the criminalization of IP infringement across Europe. The Legal Affairs Committee last week voted to introduce fines of at least €300,000 and four years’ imprisonment in serious cases of breaches of IP rights and €100,000 in minor cases. The Committee also backed a plan to set up so-called Joint Investigation Teams that would allow IP owners to take part in the investigations, alongside the police. Two US senators have introduced draft legislation designed to help IP owners enforce their rights. It has been reviewed twice by the Senate and has now been referred to the Judiciary Committee. Democrat Senator Evan Bayh and Republican Senator George Voinovich introduced the Intellectual Property Rights Enforcement Act in the Senate on February 7. The bill sets out to improve the management, coordination and effectiveness of domestic and international IP enforcement. The bill’s sponsors say that the World Customs Organization (WCO) estimates that up to 7% of global trade is in counterfeit goods. Additionally, the WCO estimates that the global trade in counterfeit and pirated goods has increased from $5.5 billion to $6 billion. Theft of information and regulatory compliance are beginning to replace malware infestation and hacking as the top security concerns, according to a poll of enterprise IT security chiefs. The second annual Cisco-sponsored poll of 100 infosec pros in large UK enterprises found that 38 per cent of respondents place theft of information as their number one concern, while 33 per cent fret about regulatory compliance. Viruses, the prime concern of 55 per cent of respondents in 2006, were cited by just 27 per cent as their top fear this year. UK business is loosing over £ 50 million a year through fraudulent employee activity. Research by consultant Protiviti has revealed that more than 3 million workers (one in ten) have admitted to various forms of stealing from work, personneltoday.com reports. Women fared better than men, with 9 per cent defrauding their employers compared to 15 per cent of male workers. London was particularly bad for corporate crime, with one in five employees in the capital admitting to theft of some kind. An estimated 760 copyright and trademark intellectual property thefts in 69 countries between January and June 2006 cost companies nearly $700 million, up 7 percent from the year-ago period, according to Gieschen Consultancy’s 2006 Mid-Year Counterfeit & Piracy Intelligence Report. The United States is top of the list, citing 205 violations and $51.7 million in losses. The United Kingdom ranked second, with 116 reported violations costing $31.1 million. Next is India, with 87 incidents at $2.5 million Malaysia, 52 incidents costing $5.9 million and China, 43 incidents at $5.3 million. Information Week 2006. “In spite of the stigma attached to DRM (mainly by the spectrum of users that prefer the free flow of information), its role to secure information against theft or losses cannot be ignored. The world DRM market has been struggling for over a decade to establish itself as a legitimate market and its time has finally come. The need to protect corporate information or copyrighted works has become a pressing concern with a real monetary value attached to it. Corporations are beginning to understand the impact of information loss and the havoc it can do to revenue streams. The entertainment industry is in an ongoing battle against pirates and has begun to embrace DRM and started evangelizing its value to the consumer market. This has helped paved the way to greater acceptance of this technology in the consumer market.” Quote from Frost & Sullivan, May 2006. Economic espionage is as real a threat as terrorism or global warming. But it is subtle, insidious and stealthy. Even if the United States finds the will to come to grips with the many threats it faces, this silent, invisible hemorrhaging of intellectual know-how and trade secrets could deliver the death blow to our pre-eminent place in the global economic world before we even wake up to the magnitude of the danger. CIO Magazine 2006. According to the U.S. Commerce Department, intellectual property theft is estimated to top $250 billion annually (equivalent to the impact of another four Katrinas), and also costs the United States approximately 750,000 jobs, while the International Chamber of Commerce puts the global fiscal loss at more than $600 billion a year. But both estimates appear to be woefully underestimated by some other estimates, there was over $251 billion worth of intellectual property lost or illegal property seized in August 2005 alone. CIO Magazine 2006. Research from Prefix IT shows that lax management attitudes have allowed a culture of data theft to flourish in the British workplace. A picture of poor processes, policy creation and communication shows that management practices are badly out of step with today’s office morals 60 percent of workers admit to theft of confidential documents, customer databases, business contacts and sales leads. Data theft is endemic, yet only 7 percent of managers believe their companies have been affected by the issue and 29 percent of managers say the topic is not recognised at board level. This climbs to 50 percent in SMEs. Few employees are aware of security measures or company policies that prevent workplace theft and the majority of workers do not believe it is ‘wrong’ to steal from the office. 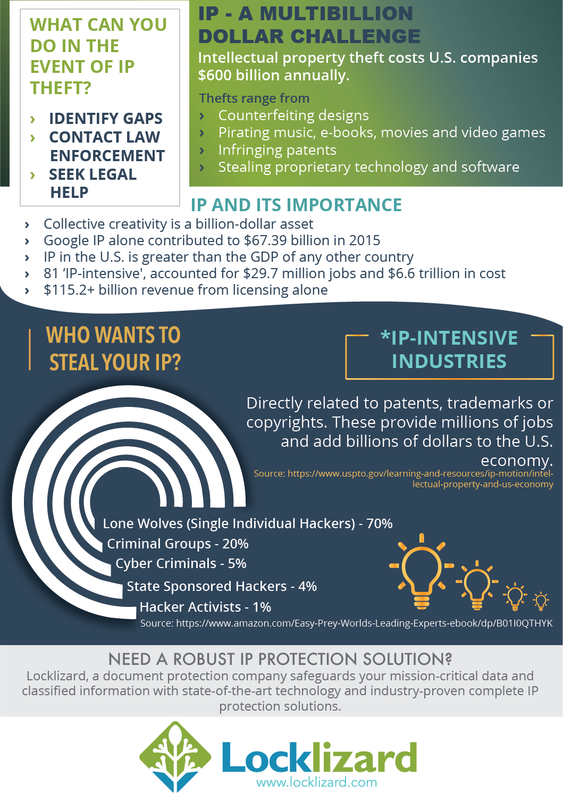 Theft of intellectual property costs U.S. businesses around $250 billion annually, as well as 750,000 American jobs. Globally, trade in illegitimate goods is worth more than $600 billion a year. Information Week 2005. Schwartz said U.S. industry lost over $1.7 billion last year alone to copyright piracy in Russia, and over $6 billion in the last five years. Over two-thirds of manufacturers fear the threat to their product intellectual property (IP) has grown over the past two years, new research has found. According to the poll conducted by Aberdeen Group, almost 25 per cent of respondents say the threat has jumped “significantly” – as they develop, manufacture, and sell products globally. These findings confirm 2005 Aberdeen benchmarks in which manufacturers reported protecting product IP as the top challenge of global design. The new study, The Protecting Product Intellectual Property Benchmark Report: Safeguarding Design IP in a Global Market, explains how common approaches to global design and manufacturing – including using unsecured emails and documents – increase IP risk. “Among companies benchmarked, 48 per cent report lost market share, 44 per cent lost sales, 30 per cent product commoditisation, and 27 per cent lower margins because of compromised product IP,” said Jim Brown, Aberdeen vice president, Product Innovation and Engineering, and report author. 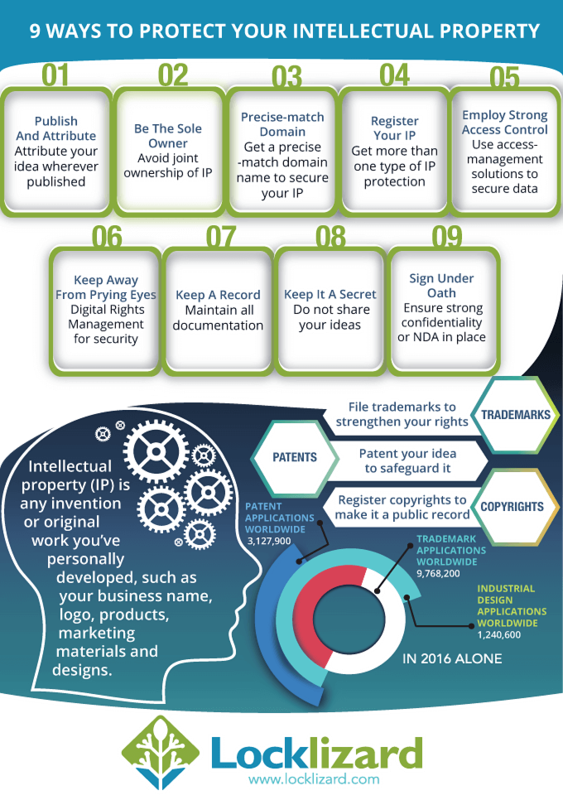 “In response, over two thirds are actively pursuing improved product IP protection, with almost one third viewing this as a top-five business priority. “Respondent companies that were identified as being best in class at protecting product IP were five times more likely to report significant gains in IP protection over the last two years than the poorest performers. These leaders have developed multi-faceted IP protection strategies that include IP-friendly collaboration, documenting IP discovery, legal protection, and enhanced data security. Most intellectual property (IP) theft is perpetrated by current and former employees. According to the U.S. Department of Justice, enterprises suffered $250 Billion in IP Theft in 2004. 69.6% of business professionals have stolen some form of corporate IP from their employer when leaving a job. 32.6% of employees leaving a job took sales proposals and/or presentations with them. 30.4% admitted to taking information such as customer databases and contact information. The most commonly used method for stealing IP is to send electronic copies of documents and files to a personal email account. 58.7% think that taking IP is as, if not more, acceptable as exaggerating an insurance claim to cover the excess charge. Only 28.2% think that IP theft is completely unacceptable. The most common justification for IP theft was that the person had created the documents/files stolen and felt they partly belonged to them. High Frequency Economics Limited (an independent financial research company) filed a lawsuit against HVB (Singapore economist) claiming that they had copied substantial portions from at least 22 of its high value research reports and had posted them on their web site claiming them as their own. Wall Street Journal 2004. A survey of professional investigators and risk managers conducted by Deloitte Forensic, at the 2004 Asia Pacific Fraud Convention, has found that intellectual property theft is rampant. Intellectual property theft includes employees who have downloaded customer lists, copied software coding or stolen business plans and taken them to the competition. Respondents to the survey said that reputational damage was the most costly impact of corporate fraud, followed by revenue leakage. Deloitte Australia 2004. Two thirds of valuable corporate data resides on laptops and nowhere else according to Gartner. Loss of mobile devices is in fact among the top three breaches in content security according to Jupiter Research. The other two are viruses that put content in unauthorized hands and unintended forwarding of e-mails, such as when an email client auto-populates the wrong address. Technology makes it too easy for staff to steal corporate secrets, says survey. Intellectual property theft is costing UK businesses billions of pounds each year, and is getting worse because of the ease with which electronic documents and files can be stolen. Some 70 per cent of the 400 workers polled by computer forensics firm ibas confessed to stealing corporate secrets when they left their last job. Over 93% of the information produced in 2003 was in digital format and more than $300 billion was lost in 2003 due to Intellectual Property theft. 70% of organizations surveyed have deployed a combination of ” fortress” security controls including file encryption, intrusion detection, firewalls, physical computer security, and access controls. These same companies reported an average loss of $2.7 million in proprietary information. CSI (Computer Security Institute) / FBI 2003. A Chinese-American man was charged with stealing $10 million in IP (integrated circuit design blueprints) from Ali Corporation. Interfax China 2003. Two former Boeing managers were charged in a plot to steal trade secrets (documents concerning a multi-billion dollar rocket program for the US Air Force) from Lockheed Martin during a competitive bid. US Department of Justice, 2003. US companies alone lose between $53 and $59 billion a year in IP and proprietary information. PWC Survey 2002. Corporate espionage accounted for 39% of leaks in 2001. Internal sabotage accounted for 25% of leaks in 2001. At least 50% and possibly as much as 80% of the value of American companies is attributable to intangible assets. The Brookings Institute. In 1999 survey by PWC and the American Society for Information Security, organizations lost confidential or proprietary information 2.45 times a year and each incident cost the company more than $500,000. The cost of digital leakage to Fortune 1000 companies in a single year was almost $45 billion. In 2002 the average cost per incident was over $2 million (CSI/FBI).